During World War II The U.S. Government Banned (But Quickly Returned) What As A Cost Saving Measure? The "Wishbone" Found In Holiday Turkeys Is The Birds'? They say you don’t appreciate sliced bread until it’s gone (or something like that). Pre-sliced bread is, in the grand scheme of human history, a relatively recent invention. 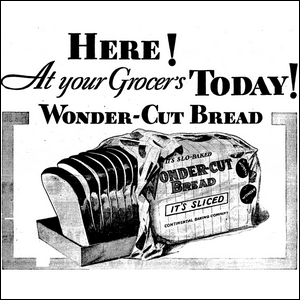 Introduced in the late 1920s, courtesy of German inventor Otto Rohwedder, sliced bread was more than well received, it was outright adored: America was a country of large families and housewives were responsible for slicing large quantities of bread for packed lunches, dinners, and such. “The best thing since sliced bread” might seem like a silly anachronistic phrase now, but for millions of homemakers the sliced thing really was a great thing. Then, suddenly, the greatness of sliced bread was gone. In order to cut down on waste (sliced bread was more sturdily packaged than plain loaves in order to preserve its shape and moisture content), the U.S. government put a ban on sliced bread. Although the ban might have been soundly reasoned out (it would in fact prevent waste), shortly after its introduction in early 1943 it was under attack. Homemakers wrote in to papers across the country complaining about the state of affairs and how whatever the ban saved in wax paper and packaging it certainly lost in labor, knife sharpening, and knife replacement. After a mere three months in effect the War Department issued a statement that further analysis revealed the savings were not as great as expected and that bakers across the country had a satisfactory supply of waxed paper such that sliced bread was a viable, and welcome option again.